2015's Star Wars: Battlefront originally released with a shallow offering of content. It featured no single player campaign, a small assortment of maps, and attempted to sell a season pass that was nearly the price of the game itself. While it eventually added some much-needed content, the way it segregated its community was ultimately its downfall. When EA announced that Battlefront II would include all future DLC for free, the community was overjoyed. What came next, however; was something far far worse than anyone expected. Battlefront II was supposed to be a simple and much-needed slam dunk for EA; Release a sequel that has more content than the prior and offer up a single player campaign within the rich and varied history of the franchise. While Battlefront II has shipped with a single player campaign, it has also structured its multiplayer progression system solely around the use of Loot Crates causing the majority of the online component to operate as pay-to-win and since this is all tied to an awful RNG system, the game in no way respects your time or you as a player. At the time of this writing, and about 15-20 hours of play into Battlefront II, EA has chosen to disable microtransactions temporarily. My review; however, will continue as if they were not disabled, as this is a review of my time spent with the game, and not what occurs apart from that experience. The problem with reviewing a games-as-a-service title is that these games continue to evolve and grow and frankly, it is impossible to update a review after each and every update. Should the game change drastically, then I will possibly update the review to reflect these changes, but that is a decision I will make at the time. In Battlefront II you play as one of four classes; Assault, Heavy, Officer, and Specialist. Each Trooper has a specific weapon set and a few core abilities that separate it from one another. Each class can equip three Star cards at a time to enhance or change up the loadouts you take into battle. The Star cards you can choose from consist of either Boost or Ability cards. Boosts change up the existing qualities of your Trooper or add new and mostly passive skills to your loadout like taking reduced damage from explosions or earning Battle Points at a much faster rate. Ability cards change up the type of ordnance you bring with you; ie: grenades, detonation charges, as well as change up how certain weapons fire. Each card has a rarity to it that also dictates the upgrade costs when wanting to level up the perk contained within the card. Both your player level and class level have to be at a required level to even access the ability to upgrade your cards. While playing matches will level up your player level, your class level is tied to the cards, so if you don't have the required level, you may need to spend crafting points to make cards you don't even want in order to reach that required milestone. Upgrade costs range anywhere from 40 crafting parts to nearly 500, and when individual Loot Crates only offer up 45-60 crafting parts, it becomes an annoying grind to simply level up one single card. Much of this annoyance can be skipped by simply purchasing Crystals in order to buy more Crates. The progression system tied to these Star Cards creates a very noticeable imbalance and rewards players for the money spent, and not their time. A co-worker asked me about Battlefront II and when I started to talk about the progression system, one element I mentioned created a sense of confusion to them. Each card has a value and the combined cards you have for that class then dictate their level. I tend to favor the Heavy class as I find I prefer the fire-power a bit more than the other classes. My Heavy class, without crafting any cards, was at rank 8, whereas the Specialist, a class I have yet to even really use, is rank 11. Yes, a class I've barely even touched is a higher rank than the one I have spent nearly 8 hours with, and this is due to the randomness of what the Loot Crates offer. While I can use Crafting Parts to craft myself some new cards, I will look to require those parts to upgrade my existing cards to make my Heavy Trooper much more effective. I mentioned before that Battlefront II does not respect your time, and this is what I meant. It doesn't matter how much effort you put towards a certain class, your rewards, apart from the crafting of said cards, is entirely random. There are effectively three types of currency at play; Credits, Crystals, and Crafting parts. Credits are earned either by playing the game, buying them with Crystals, or earning them through a series of challenges. Credits are used to purchase new Hero characters, or the Loot Crates themselves. Crystals are earned simply by spending real money in the online store. Crafting parts are earned only through Loot Crates or through additional challenges. The Loot Crates themselves come in three basic varieties; Trooper, Starfighter, and Hero. Trooper Crates cost 4,000 Credits or 200 Crystals and contain the cards needed to upgrade your classes. These are the more important cards as these characters are 90% of your experience in multiplayer. Starfighter Crates which are for the vehicles you'll pilot cost 2,400 Credits or 120 Crystals, whereas the Hero Crates cost 2,200 Credits and 110 Crystals and contain cards suited to your heroes. At the end of each match, I would roughly leave with 150-300 Credits and after playing another 10-12 matches to earn enough to unlock a Trooper Crate, nothing is more upsetting that going through all that to unlock cards for a class you don't even play as or getting a few duplicates, not to mention the pitiful amount of Crafting Parts they give you, yet the game is built upon on this gameplay loop. Loot Crates are simply put, the main way you will rank up your Trooper, Starfighter, or Hero character. While yes, you can earn credits and crafting parts by playing the game, or by completing challenges, they are drip fed at an intentionally slow pace to make the purchase of them, with real money, that more attractive. The challenges are also finite, meaning you will eventually run out of them, slowing that grind even more. Crafting parts are the hardest of these currencies to come by as you don't earn them naturally in-game and these are essential to crafting new cards or for the process of upgrading them. While you do earn a free Loot Crate every day, you often only see it contain 5 crafting parts and 125 credits, an amount that feels more like a middle finger than anything rewarding. The addictive nature of gambling and the parallels of what Loot Crates represent are easily linked and prey on those with addictive personalities or those who simply have the cash to fast-track themselves through the game. Loot Crates have been a constant source of controversy and even games that regulate them to only offer cosmetic items like skins or player emblems, still promotes that source of randomness to them that creates that same sense of addiction. I can't tell you how much money I spent on Overwatch, a game I rarely play, because I wanted the Halloween outfit for Mercy, a costume I failed to unlock despite the amount money I sunk into it. Skins, guns, what-have-you, all are items that people want and can create a sense of addiction towards these little mystery boxes. Apart from the Star Cards, you will unlock emotes and victory poses through the Loot Crates that you can use to customize your characters. Sadly, there isn't any direct customization with new helmets, paint jobs, or other visual indicators to separate yourself from the pack. Attack of the Clones, indeed. This is sort of an odd omission as the first Battlefront had different faces and species that you could swap to once you unlocked them. The core multiplayer experience of Battlefront II is still enjoyable from a mechanical point of view. Shooting is fairly satisfying, and the controls are every bit as enjoyable as the previous game. 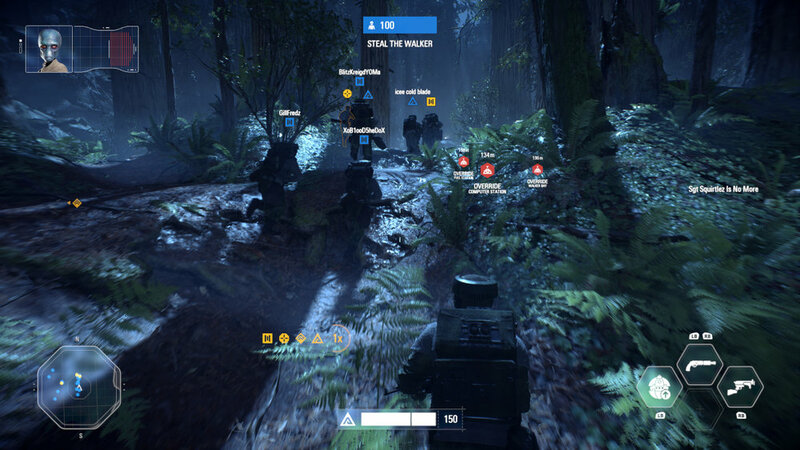 You can still swap back and forth from third-person to first-person, however; Hero characters are only playable from the third-person perspective, as are several abilities for your regular Troopers. The only aspect of the controls that I found somewhat off was that duck and roll are the same button but act differently when you hold down or tap said button. While I am not a huge fan of this design, it wasn't something that I found was getting me killed any quicker than I already was. One new addition that works extremely well is the Gears of War style active reloading that pops up when your gun is forced to reload. It's a small change but one that felt extremely natural. Apart from the loadouts that you take with you into battle, you will earn Battle Points to further your progress in a single match. Battle Points are limited to just that match and allow you to respawn in as an upgraded trooper, in the cockpit of a classic vehicle, or the much sought after, and expensive to unlock Hero characters. As you take down foes or save your allies, most actions will net you points that can be cashed in during the respawn screen. The better you do will earn you more points, and this is where I have issues with how to access these Hero characters. In the original Battlefront, you found icons on the map that allowed you to embody the likes of Luke Skywalker, Boba Fett, or Darth Vader. This allowed even the less skilled players a chance at taking control of these iconic characters and feeling a bit more powerful, even for a few fleeting minutes. Here in Battlefront II, you have to earn a massive amount of points to even have an attempt to play with them. While I am not a horrible player, I rarely ever earned enough Battle Points to even dream of playing with these established characters. If the matches ended too soon, you really had no chance. You almost have to sabotage your team for the matches to last long enough to even warrant the attempt to earn 8,000 Battle Points to play as one of the Jedi. In any given match, I would earn roughly around 5-6,000 Battle Points, just being slightly out of reach each time. This method of using the Hero characters makes the better players always at the top of the leaderboard and the less skilled players, constantly dying from a whirlwind of lightsabers. 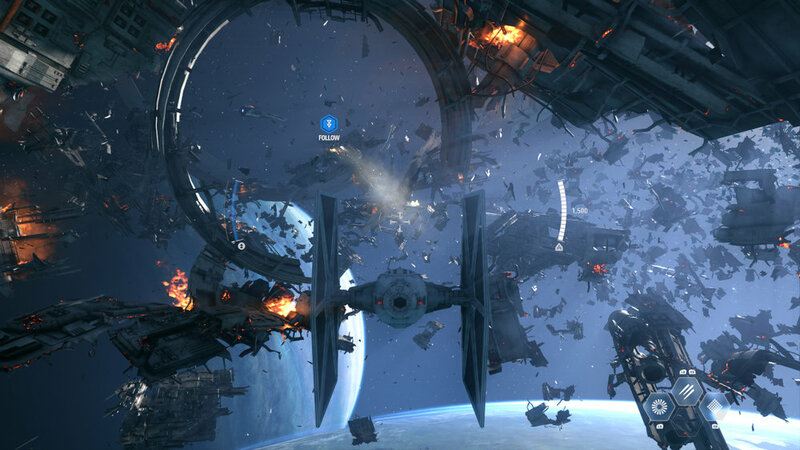 Star Wars Battlefront II features 6 modes; Galactic Assault, Strike, Blast, Hero vs. Villains, Arcade mode, and Starfighter Assault. Strike is an objective-based mode centered around two teams of four. Starfighter Assault will have players complete objectives while behind some of the most iconic Starfighters of the Star Wars universe. Sticking to Iconic elements of the Star Wars franchise, Hero vs. Villains is just that. Here, players will take control of established Star Wars characters in a four-on-four battle. Arcade mode allows for some single player or co-op split-screen action away from the online portion of the game as you take on AI foes in various scenarios. Lastly, Blast is a standard 20 player deathmatch mode that is fairly enjoyable, but probably the least popular mode in the game. Galactic Assault is by far the real star of the show as this is a 20-on-20 battle where players will attack or defend a location, attempting to push players back to defeat or withdraw and attempt to counter the assault. This is where the progression system, the Battle Points, and everything else the game can offer really is created for. Each map has a series of various objectives like dropping a pair of AT-AT Walkers, protecting the Palace on Theed, or taking over various locations in Mos Eisley. While some of the maps are perfect for this mode, some suffer from rather poor map design, or feel far too similar to the previous game. Galactic Assault features three prequel maps, five original trilogy maps, and three Force Awakens-era locations. As I mentioned, the previous Battlefront game shipped without a campaign. The entire focus of the title was devoted to multiplayer and even the modes where you would battle AI forces with loose narrative objectives just wasn't enough. Here, Battlefront II actually offers a decent campaign, with only a few issues along the way and a final mission that sadly leaves so much unresolved, that is until the additional content hits later this year. While you play the campaign as Iden Versio, Commander of the Imperial Special Forces unit, Inferno Squad, you will swap occasionally to various Star Wars heroes like Luke Skywalker, Han Solo, and Kylo Ren. While playing as these characters can be somewhat enjoyable, I found myself far more entertained through Iden's story and felt more distracted by these other experiences than being entertained by them. It is clear that these characters were injected into the story solely to make you excited to unlock them via the multiplayer portion of the game. The story for Iden is one that can be easily predicted and follows many of the typical tropes you'd expect, but I still found the plot beats to be very enjoyable and frankly, those elements make for a solid campaign. While EA claims that the story spans 30 years of Star Wars history, that is only partially right. The story does attempt to have a solid ending, but then it goes ahead and packs on one more chapter that then takes place some 30 years after. The level isn't in anyway enjoyable and feels tacked on and rather pointless. The campaign features some elements from the multiplayer that serves it well. You can equip Star Cards to change up certain elements for Iden, as well as swapping out weapons when you find certain caches placed around the map. The voice acting is pretty good later on, but the first few moments with Iden herself feels as though the actress is grinning from ear to ear as she delivers her lines in the most cheesy delivery I've heard in years. After that initial scene, and then especially when the plot starts to go the way you'd expect, her dialogue is fantastic and she really starts to grow on you. Iden is also joined by some pretty decent supporting characters that work well within the story. I enjoyed several of the scenes with her droid, even the brief moments at the start of the game where you take control of it. I enjoyed the Del Meeko character, as well as a character named Shriv, who has some really great moments here and is a stand out by far. There are two missions that I felt held back the campaign. 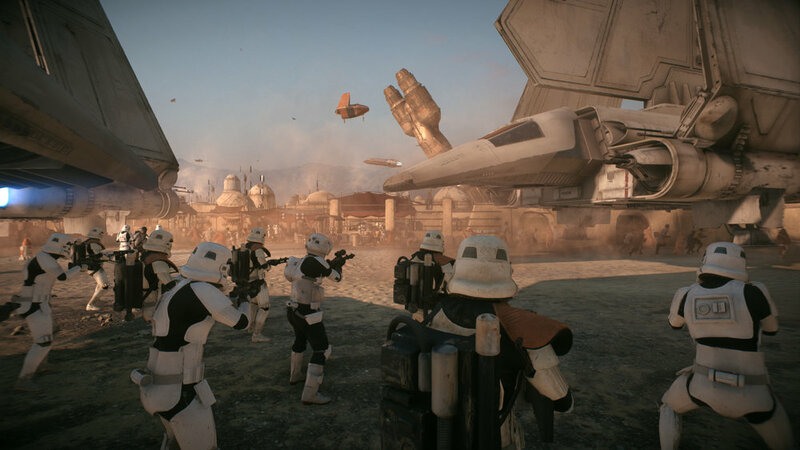 The chapter on Theed is merely a stand-in for the multiplayer mode and serves no real narrative purpose other than training you for the Galactic Assault mode. Towards the end of the story, you will jump into the boots of Lando for what may be the worst mission in the game. While the missions as Luke and Han are not terribly impressive, they do have several moments that succeed in being really enjoyable. That being said, if I had the option to only play the Iden missions, I would select that option in a heartbeat. The campaign features a wealth of vehicle missions that take place on the ground as well as the farthest reaches of space. These missions are a highlight of the campaign and really go to show that we need another space battle Star Wars game as there hasn't been one in years. Star Wars Battlefront II is a visually and audibly gorgeous game. The game nails all the sights and sounds of the franchise in every way you would expect. Characters, vehicles, and locations all look flat out amazing and combining that with the signature blaster fire and incredible score makes this a superb effort to capturing the feel of Star Wars. That praise aside, this game is buggy as hell. Nearly every cutscene stuttered or flickered during my entire playthrough, and I lost track of how many times I got stuck in the geometry. For every moment the game rewarded me with some visual feast to the eyes, it would have some technical problem there to greet me. While it is unclear if the game was rushed, it certainly can feel like it. There is a good game in Battlefront II but it is sadly buried behind an awful pay-to-win progression system that would rather see you spend more money than time. It is hard to say how this game will improve, or if it ever will. EA has been injecting microtransactions into several of its properties that it shouldn't have come as a surprise at the dark side shenanigans that occurred here. The campaign works well when they are not trying to sell you on the multiplayer experience and I wish it had been solely written around Iden than forcing us to play as the iconic characters of the series. I really wanted to like Battlefront II, but the progression system is one of the worst I have ever seen and in no way does it respect your time. I know I have said that several times now, but it stands for exactly what this game is. Battlefront II should have been the Star Wars game we were looking for, but sadly, it is not, and that's a damn shame. star wars: battlefront II WAS PURCHASED BY THE REVIEWER.